architecture in japan surveys the contemporary condition of the country’s built environment, showcasing a range of innovative projects and the diverse materials and unconventional forms employed in their construction. 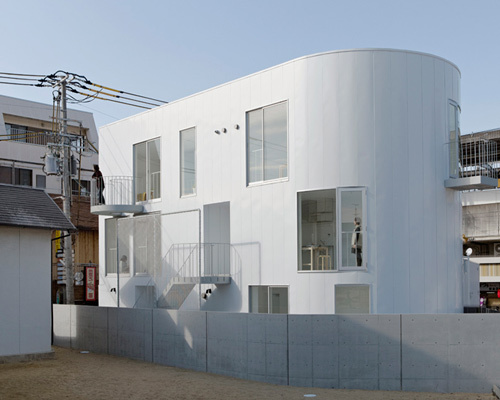 SPACESPACE, founded by takanori kagawa in 2006, is a japan-based architecture practice that 'invent new designs connected to present social systems'. 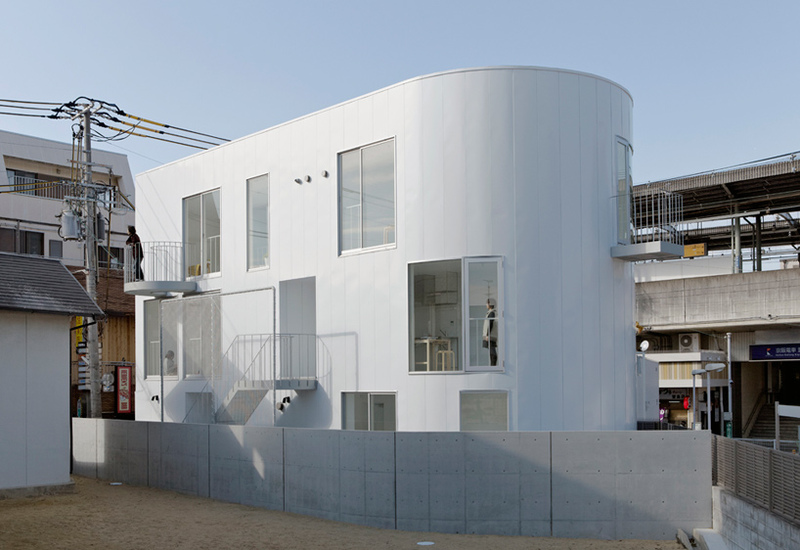 junko kishigami joined the firm in 2010.
japanese architecture practice SPACESPACE (takanori kagawa, junko kishigami) has shared with us images of ‘d-apartment’, a three-storey collective housing project in osaka, japan. utilizing the average size of a single-family dwelling as the starting point of the design, the apartment building elongates and bends the layout to create a gradient of privacy while maintaining an intimate and connected sense of space. situated adjacent to a train station surrounded by low-lying multistorey buildings, the site is faced with multiple environmental conditions: a bicycle park space, shrine and shops to the west, while the east exhibits a quieter presence with a small station plaza and roundabout. furthermore, a nearby 700-year old camphor tree and elevated waiting platform limits the plot’s amount of sunlight. narrow and irregularly-shaped, the site propelled the design forward with a number of limiting conditions. stretched into a long corridor-like plan, the building coils in on itself into a keyhole-shaped layout to fit snugly in the five-sided plot. the interstitial space generated in the bend serves as a private ‘alleyway’ for the inhabitants and houses the open-air staircase between levels. by weaving the circulation route in and through the courtyard, a sense of connection and transparency is encouraged between dwellers. this pocket of outdoor space also facilitates natural ventilation and daylighting which is further promoted by aligning windows to face one another. the singular nature of the layout enforces a simple circulation route within each unit: public programs such as kitchen, living and dining room are placed on one end while the more private area is located behind the bend. by formally separating these zones, the design creates separation without the aid of full partition walls. the maximized surface area of the coiled layout enables the interior to be flanked with windows on both sides, securing a very high level of natural daylight. I want to live there too!!!!!! Agree with SB above, sensational, beautiful and compact! D stands for ‘D’ shaped plan as the architect has tweeted. (in Japanese) Better correct it.